Uhuru, Zain Verjee tight hug sets tongues wagging. 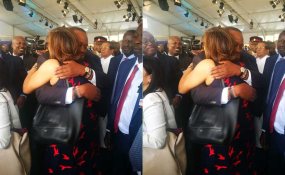 A photo of president Uhuru Kenyatta tightly embracing former CNN news anchor Zain Verjee has caused a buzz online stir as netizens attempted to come up with the best caption. The picture that has been shared numerous times captures Mr Kenyatta and Ms Verjee in the warm embrace, with ODM leader Raila Odinga and other officials looking on. President Kenyatta was attending a summit at the United Nations headquarters in Gigiri on Thursday. What has kept Kenyans online busy on their keyboards is the facial expressions on the rest of the people in the picture including Mr Kenyatta's. Jamo Ma'yangai said, "Why Raila look like he is trying to digest a bucket of lemons." Minor Jey remarked: "Kibaki could not have tried this even behind the curtains!" Karen Mwangi said, "President nah... He even closed eyes this must be a very compassionate hug." Calen Mokaya wrote, "Our big man is really enjoying the embrace. hadi amefunga macho." Le Kosen said, "That was too tight your excellency!"